Breath, A Samuel Beckett Festival. Photo by Kevin Monko. Rowan is a cutting-edge performing arts program in the Northeast, strategically located 20 miles outside of Philadelphia and 90 miles from New York City. Our unique program emphasizes the integrated study of theatre and dance, developing highly skilled and well-rounded performers who make creative, vibrant, and connected physical choices on stage, differentiating our graduates from other artists in their field. 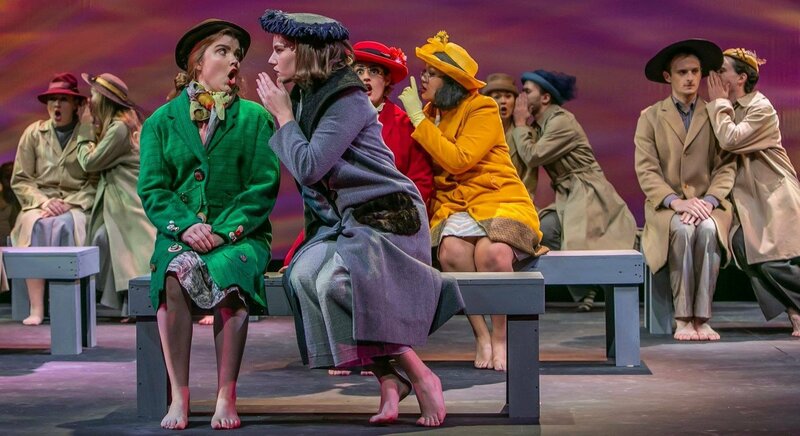 Our NAST (National Association of Schools of Theatre) accredited-program trains students in a common core of production classes intensified by four focused Theater tracks: Acting, Musical Theatre, Design/Tech, and Theatre Education as well as a BA in Dance. While students train at Rowan, we aim to build a highly individualized and collaborative performance ensemble. This approach allows for close faculty-to-student mentorship, abundant Mainstage and student-directed performances, and ample design opportunities. At Rowan, we foster a nurturing environment that creates a holistic artist prepared for the physical demands of a career in contemporary theatre and dance. In conjunction with core major classes, Rowan offers intellectually challenging and stimulating courses to create well-rounded students. Our award-winning program is led by a group of faculty members that maintain professional artistic careers in New York and Philadelphia, providing current students and graduates alike with a host of professional opportunities in all aspects of the theatre. This prepares our students for a smooth transition into the professional world in more ways than they had previously thought possible. Rowan's training is unlike any other. We aim to create not just performers and designers, but artists who can become informed masters of their own careers. Our conservatory level training within a liberal arts context gives you the best of both worlds. Are you ready to create? Apply today! AUDITION DATES: December 8, 2018; January 27, 2019; February 17, 2019; March 10; March 24, 2019. At the undergraduate level, the Department of Theatre & Dance offers a Bachelor of Arts (BA) in Theatre and a Bachelor of Arts (BA) in Dance. The theatre degree features four designated tracks for in-depth coursework in: Acting, Musical Theatre, Design/Technical and Pre-Teaching. The four tracks share a core curriculum of theatre arts courses while allowing students to extend study in their specific field of interest. Undergraduate students from other majors may also share in our interdisciplinary activities by choosing to minor, or concentrate, in theatre or dance. Two programs are offered at the graduate level: The Master of Science in Teaching (MST) in Theatre offers teaching certification through a BA/MST program, consisting of the Pre-Teaching Track in the BA program and the MST Theatre Education program through Global Learning & Partnerships. The Master of Arts (MA) in Theatre: Arts Administration is a new, online Masters program offered through the College of Graduate and Continuing Education.